An interesting thread has developed at the google hexayurt group regarding decorating a hexayurt for Burningman. There are some beautiful pictures and some great ideas. While we’ve never been to Burningman and have never built a hexayurt, we do know a little about tape. Colored duct tapes will stick to the foil covered panels that most hexayurt builders use, but duct tape uses an organic (latex) rubber adhesive that may not stand up well to exposure to high heat and direct sunlight. If the adhesive begins to separate from the tape and ooze out, it will then become a dust magnet. You might want to consider using an all vinyl tape instead. These tapes use a synthetic rubber adhesive that may perform better in extreme heat, and may also be less likely to ooze adhesive around the edges. Because it has no fabric reinforcement like duct tape, and is thinner, it can be cut precisely to make intricate shapes and very uniform colors. 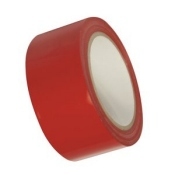 While we’ve never decorated a hexayurt, we did use this tape to make a quick trim repair on one of our trucks and it has stood up to the heat of several North Carolina summers.